The latter half of the 19th century saw the introduction of a wide range of special tools designed to perform one or more of the five basic arts of metal cutting: drilling, turning, milling, grinding, and planing. The introduction of hydraulic, pneumatic, and electric controls led to a greater degree of automatic operation. Another key advance was the use of individual electric motors in place of the belt, shaft, and steam engines. The increased speeds used to perform scores of different machining operations on a part with a minimum of human assistance have been introduced into many metal processing factories producing on a mass production basis. Shortly after World War II it became apparent that machined structural parts would be required in order to meet the greatest strength-to-weight ratio for future supersonic aircraft. In the late 1940's research and development on numerical control as we know it today was started. By 1947 the U.S. Air Force was finding that the complex shapes required for modern aircraft and missile manufacture were causing the various manufacturing programs to fall behind their projected production schedules. Manual and tracer-controlled machines could not keep up with the demand and at the same time accommodate the many engineering design changes needed as the aircraft were further refined. The numerically controlled machine tool system was developed to meet the needs of the aircraft industry. Research had revealed that the amount of machining time increased in almost the same ratio as the speed of the aircraft. In an attempt to avoid the skyrocketing cost of high-speed aircraft production, the Air Force awarded a contract for the development of some automatic means for machining small production runs on general-pupose equipment. 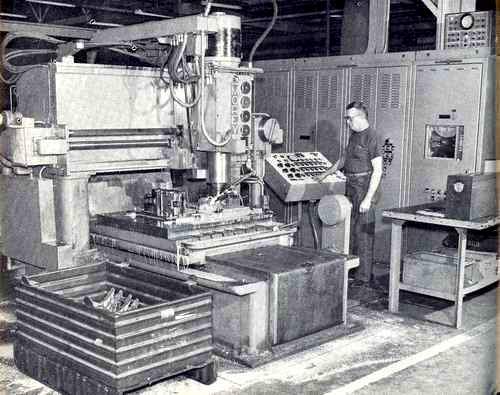 In 1951, a modified, standard vertical-tracer milling machine was demonstrated. The first bulk purchase order for numerically controlled tools was placed-by the Air Force in 1955. About 1957, these first automated tools began to appear in plants contracted by the Air Force. The rather harsh realism that successful implementation of the newly developed equipment required a new approach toward machining practices had to be overcome. The new approach required the cooperative effort of many varied talents, from mathematicians to machine operators, to utilize the new equipment successfully. In recent years, the use of N/C has expanded into non-metalworking applications. As an example, N/C machines are now available for automating every step in the preparation of printed circuit boards used in most electronic products. The film used to screen the circuit on the blank board is prepared on an N/C photo artwork generator. Other machines automatically perform the drilling, component inserting, soldering and testing functions. In 1970, the scope of N/C applications has been further expanded by the introduction of low cost contouring controls. The SLOSYN Continuous Path Contouring Control offers a number of outstanding features, including linear and circular interpolation. Innovations of numerical control have contributed to revolutionary practices in manufacturing technology which have had a dynamic impact on the automatic control of machining procedures. N/C involvement has grown from a limited aerospace production to one including a wide variety of manufacturing industries. Knowledgeable men in numerical control activities have formed societies to study and promote N/C. Within the last few years, several books and articles have been published about NC concepts, problems, and applications. Finally, N/C has established a vital niche for itself as a prominent concept which promotes efficient manufacturing procedures.